No more bad hair days for you! This trendy, messy top-knot is quick and simple to do and it works better on hair that hasn’t been washed for a day or two! 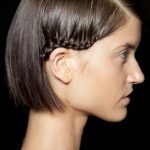 The sides and back are swept up, without brushing, and secured on the crown with a covered elastic pony-tail fastener, leaving plenty of trendy wisps at the sides and the nape. The top-knot is made by twisting the pony-tail and then pinning it into a small messy bun on top. The twisting leaves lots of short wisps, which form a super spiky halo around the bun! 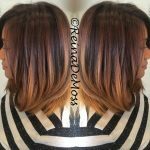 This style looks fabulous with highlights and trendy dark roots, which add tons of contemporary style through colour contrasts and different textures. This versatile up-style is great for wearing anytime and can be dressed up with dangly earrings for sophisticated evening wear! Here are some trendy hairstyles from the red carpet, check it out here. Under: Popular Hairstyles Afro Hairstyles for Women – Exuberant Spirals & Incredible Volume!